In a startling discovery, researchers mapping the Greenland ice sheet have found that two sub-glacial lakes containing billions of gallons of water dried out suddenly in the last few years. While one lake drained away to leave behind a mile-wide crater, the other lake drained away and filled up twice in the last two years. “The fact that our lake appears to have been stable for at least several decades, and then drained in a matter of weeks—or less—after a few very hot summers, may signal a fundamental change happening in the ice sheet,” said Ian Howat, associate professor of earth sciences at Ohio State University, in news published on the university website. Howat led the team that discovered the cratered lake. This lake, found to have pooled over 40 years, drained away through a meltwater tunnel within a single season in 2011. 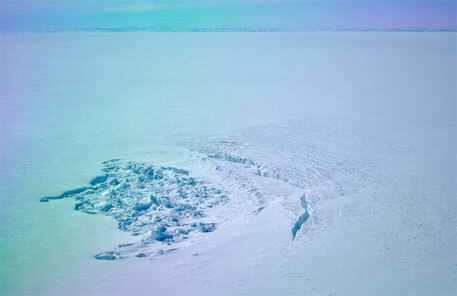 Meltwater tunnels under the ice sheet allow heat and water to flow further into the Greenland coast and are potentially causing the ice to melt faster, say researchers. Studies on each lake were published separately in journals The Cryosphere and Nature.